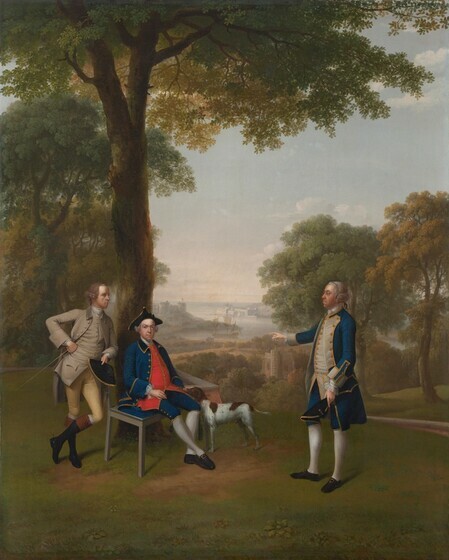 Eighteenth-century British painters used the word “conversation” to describe informal group portraits as well as imaginary views of daily life, now called genre scenes. In portraiture, conversation pieces referred to pictures commissioned by families or friends to portray them sharing common activities such as hunts, meals, or musical parties. The inclusion of several figures “conversing” in familiar settings tends to make conversation pieces appear intricate and, therefore, small in scale. However, these intimate moods could be rendered in actual dimensions that are huge. Several full-length group portraits in the collection of the National Gallery of Art combine the charm of small conversation pieces with the formality of life-size likenesses in the Grand Manner. Conversation pieces came into fashion during the 1720s, largely due to the influence of William Hogarth, Britain’s first native-born painter of international stature. Significantly, they arose at the same time as a new literary development, the novel. Not until the later 1700s did the British innovations of conversation pictures and fictional novels become common in other Western nations. A large new middle class emerged as Britain’s colonial empire expanded and its Industrial Revolution began. Socially spurned by the aristocracy, these wealthy merchants, industrialists, and colonial landowners developed their own more natural and casual manners that made perfect themes to enliven both novels and group portraits. Conversation pieces and novels, by fictionally portraying situations from real life, differ from the allegorical portraits and epic poetry preferred by the nobility. Prosperous middle-class people who normally commissioned conversation pieces are similar to the characters who populate such novels as Daniel Defoe’s Moll Flanders, Henry Fielding’s Tom Jones, A Foundling, or Jane Austen’s Pride and Prejudice. Arthur Devis first trained as a sporting and topographical artist, which explains the prominence given to animals and landscapes in his portraits. This conversation piece was commissioned by a twenty-four-year-old patron to commemorate his mercantile success. Assessing the viewer with a demeanor of self-importance, Arthur Holdsworth is distinguished by his seated pose and adoring pointer. In the distance, one of his trading ships docks at Dartmouth harbor in southwest England. Dartmouth Castle, of which he soon will become governor, guards the approach from the English Channel. The ship’s captain, dressed in the uniform of the merchant navy, reports on the journey’s profits. Holdsworth’s brother-in-law, wearing spurs and carrying a riding switch, leans against the bench in a cross-legged stance then fashionable among young dandies. Two other canvases by Devis are included among the National Gallery of Art’s conversation pieces. Portrait of a Gentleman Netting Partridges, dated 1756, includes a dog crouching at the lower left and a rustic, thatch-roofed cottage. Members of the Maynard Family in the Park at Waltons is unusually large among Devis’ more than 280 conversation pieces. The women and children, shown before their newly remodeled country house, pick flowers and play a guitar. Merton at Oxford University is among the oldest colleges in the English-speaking world. In 1264-1274, the chancellor of England, Walter de Merton, endowed it as a secular institution patterned after higher education in religious orders. This painting's background depicts Merton College, including its chapel tower, as seen from Christ Church Meadow; these thirteenth- to fifteenth-century buildings still stand. Details that show changes to the architecture date the picture to around 1754/1755. The unidentified youth wears the black gown of an undergraduate, a robe without a hood. He holds a black mortarboard and wears a simple white cravat. (Today, Oxford’s male students wear white bow ties.) Underneath this plain gown, though, he sports a satin coat and a waistcoat with ostentatious embroidery. 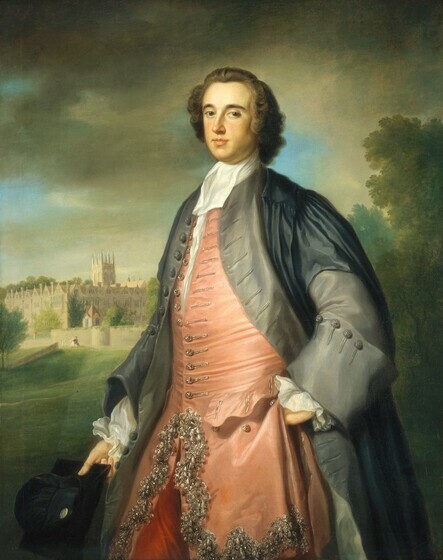 The absence of sleeves on his academic robe marks this aristocrat as a “commoner,” meaning a student who paid tuition. A gown with short sleeves indicates a “scholar,” or someone who required a financial grant. The painter George Knapton, son of a prosperous London bookseller, spent seven years studying in Italy. A major artist in pastel chalks, Knapton capped his career as curator of the British royal picture collection. George Stubbs, one of Europe’s most important painters of animal subjects, was virtually self-taught as a zoologist, botanist, painter, and engraver. After embarking on a career as a portraitist, he became lecturer on human and animal anatomy at the hospital in York. As much a scientist as an artist, Stubbs published The Anatomy of the Horse in 1766, illustrated from his own dissections. He also experimented with Josiah Wedgwood in painting with enamels on ceramic plaques. Although Stubbs was voted into London’s Royal Academy of Art, he chose not to join that cultural institution in order to pursue his scientific studies. 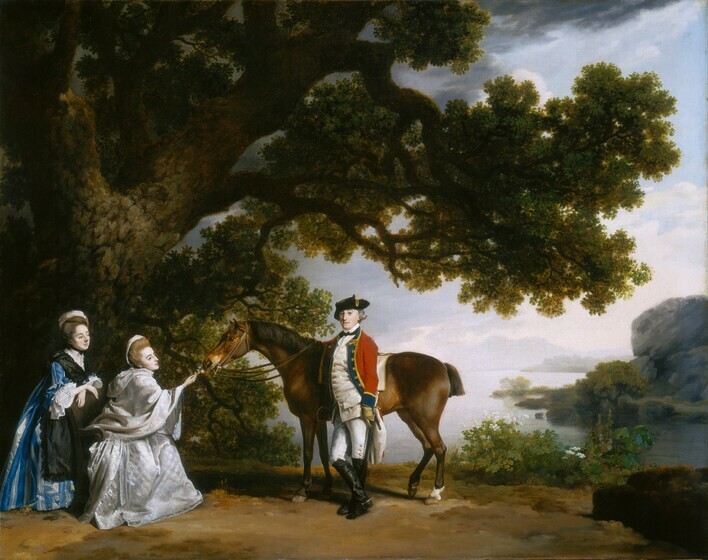 This canvas celebrates the marriage in 1769 of Captain Samuel Sharpe to Pleasance Pocklington, heiress of Chelsworth Hall, Suffolk. (The captain retired from the Scots Guard in the same year and adopted his wealthy wife’s family name.) The bride in her wedding gown offers a bouquet to her husband’s steed. The other woman may be Frances, the captain’s unmarried sister. Typical of Stubbs’ straightforward, scientific approach, the horse is rendered accurately, without artificial sentiment. The lake’s haze demonstrates Stubbs’ understanding of weather, and the majestic oak tree is an archetypal specimen that appears in his other conversation pieces. The name of this family, whose father proudly confronts the viewer, remains unknown. 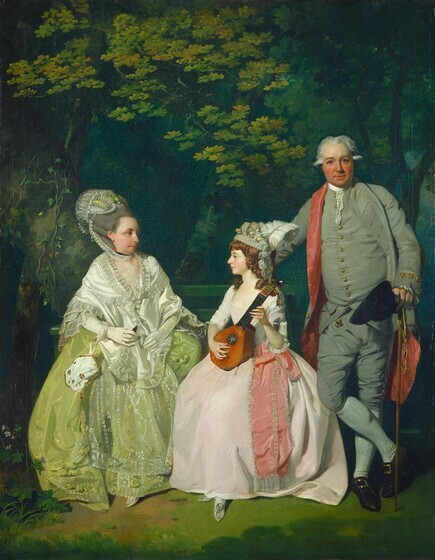 The mandolin was a studio prop of the painter Francis Wheatley and therefore does not help identify the sitters. The modish, diagonally swept-back hairstyle of the mother and daughter dates this conversation piece to the late 1770s. The ladies’ fashions and Wheatley’s use of light, bright colors reveal an influence from contemporary French rococo art. The “V”-shaped geometry that unifies the group, silhouetted against the dark foliage of a park, typifies Wheatley’s well-structured compositions. Wheatley altered this design in progress, deciding to move the father’s knee in front of the daughter’s skirt. Now that the oil paint has become more transparent with age, the original outline of her dress shows through his breeches. Wheatley entered the Royal Academy school in 1769 as one of its first students. Oddly, his election as a member of the Royal Academy in 1791 damaged Wheatley’s career because his rival for that position, the young Thomas Lawrence, was favored by the royal family. Society immediately snubbed Wheatley, and his portrait commissions declined. To make ends meet during the 1790s, Wheatley turned to painting sentimental scenes intended for engraving. The Cries of London, thirteen popular prints made after his canvases, vividly document a vanished lifestyle of street vendors hawking their wares. This striking portrait is somewhat unorthodox by eighteenth-century British standards. Important men seldom were shown with their arms crossed over their chests, because that gesture denoted casual nonchalance. Here, the informal pose is linked to a setting of the most formal pretensions—a massive boulder and stormy sky—normally used to signify a military commander in the midst of battle. This extraordinary combination of relaxation amid grandeur may someday help identify the sitter. The painting's earliest record dates only to 1916, when it was sold from an aristocratic Derbyshire estate as the likeness of an ancestor "who was a famous admiral." This claim may be inaccurate as this man is not wearing a naval uniform. His elegant tailoring is that of a civilian, and he toys with a walking stick. The detailed attention to realistic texture, such as the felt tricorn hat, plush velvet lapels, and soft leather gloves, characterize the style and meticulous technique of Joseph Wright of Derby. Wright's Italian Landscape and mythological subject, The Corinthian Maid, are also in the Gallery's collection. When Johann Zoffany arrived in London in 1760, the twenty-seven-year-old painter already had worked in Rome and his native Germany. Under the patronage of the celebrated actor David Garrick, Zoffany came to the attention of the royal family. Zoffany’s fame rested on lively depictions of actors performing on stage and of connoisseurs examining art galleries. 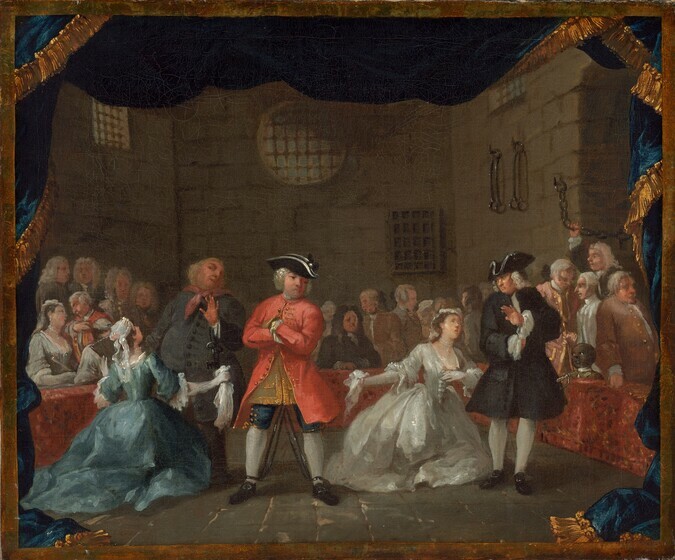 Revitalizing the conversation-piece format developed by William Hogarth in the 1720s, Zoffany was nominated to the Royal Academy of Art in 1769, the year it opened. 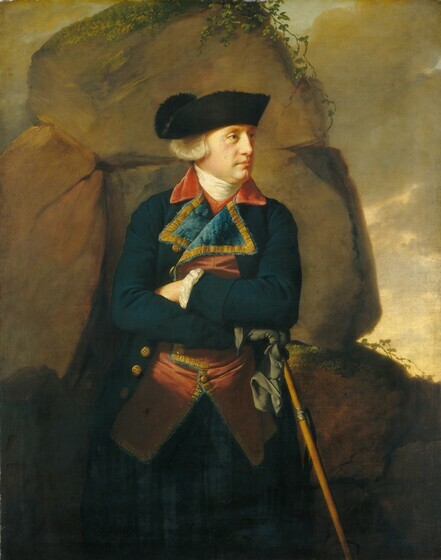 After King George III rejected one of Zoffany’s court commissions because it included portraits of some commoners, the artist found it expedient to spend much of the 1770s in Florence, Italy, and the 1780s in Calcutta, India. The Lavie Children represents all seven siblings in an English family of French Protestant ancestry. Their father, Germain Lavie, was a solicitor in Putney, a ward in southwest London. Seven-year-old Germain, who would become a lawyer like his father, balances atop a seesaw, waving his hat in triumph. His active pose accentuates Zoffany’s carefully conceived design of complex curves that interweave among the children. 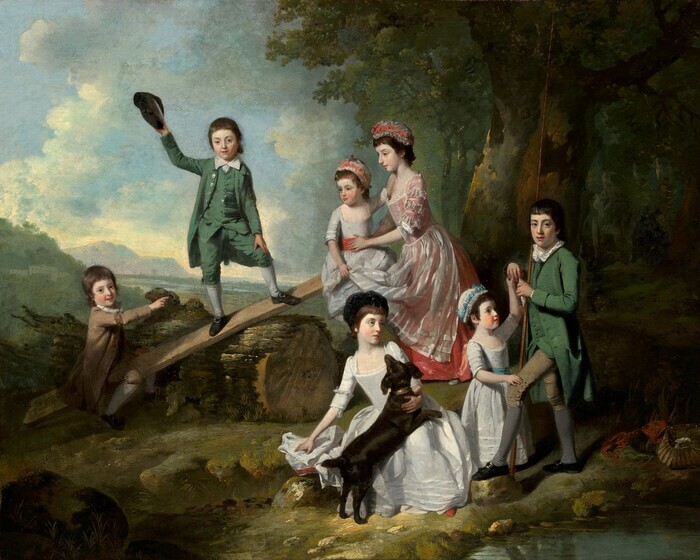 Zoffany added interest to his conversation pieces by such animated postures and gestures as Thomas anchoring the seesaw, Maria steadying baby Emilia, Sarah petting a playful spaniel, and Frances reaching for John’s catch of fish.